*4Honda Research Institute Japan Co., Ltd.
Understanding auditory scenes is important when deploying intelligent robots and systems in real-world environments. We believe that robot audition can better recognize acoustic events in the field as compared to conventional methods such as human observation or recording using single-channel microphone array. We are particularly interested in acoustic interactions among songbirds. Birds do not always vocalize at random, for example, but may instead divide a soundscape so that they avoid overlapping their songs with those of other birds. To understand such complex interaction processes, we must collect much spatiotemporal data in which multiple individuals and species are singing simultaneously. However, it is costly and difficult to annotate many or long recorded tracks manually to detect their interactions. In order to solve this problem, we are developing HARKBird, an easily-available and portable system consisting of a laptop PC with open-source software for robot audition HARK (Honda Research Institute Japan Audition for Robots with Kyoto University) together with a low-cost and commercially available microphone array. HARKBird enables us to extract the songs of multiple individuals from recordings automatically. In this paper, we introduce the current status of our project and report preliminary results of recording experiments in two different types of forests – one in the USA and the other in Japan – using this system to automatically estimate the direction of arrival of the songs of multiple birds, and separate them from the recordings. We also discuss asymmetries among species in terms of their tendency to partition temporal resources. R. Suzuki, S. Matsubayashi, R. Hedley, K. Nakadai, and H. Okuno, “HARKBird: Exploring Acoustic Interactions in Bird Communities Using a Microphone Array,” J. Robot. Mechatron., Vol.29, No.1, pp. 213-223, 2017. C. K. Catchpole and P. J. B. Slater, “Bird Song: Biological Themes and Variations,” Cambridge University Press, 2008. M. L. Cody and J. H. Brown, “Song asynchrony in neighbouring bird species,” Nature, Vol.222, pp. 778-780, 1969. R. W. Ficken, M. S. Ficken, and J. P. Hailman, “Temporal pattern shifts to avoid acoustic interference in singing birds,” Science, Vol.183, No.4126, pp. 762-763, 1974. J. W. Popp, R. W. Ficken, and J. A. Reinartz, “Short-term temporal avoidance of interspecific acoustic interference among forest birds,” Auk, Vol.102, pp. 744-748, 1985. R. Planqué and H. Slabbekoorn, “Spectral overlap in songs and temporal avoidance in a peruvian bird assemblage,” Ethology, Vol.114, pp. 262-271, 2008. R. Suzuki, C. E. Taylor, and M. L. Cody, “Soundscape partitioning to increase communication efficiency in bird communities,” Artificial Life and Robotics, Vol.17, No.1, pp. 30-34, 2012. X. Yang, X. Ma, and H. Slabbekoorn, “Timing vocal behaviour: Experimental evidence for song overlap avoidance in Eurasian Wrens,” Behavioural Processes, Vol.103, pp. 84-90, 2014. C. Masco, S. Allesina, D. J. Mennill, and S. Pruett-Jones, “The song overlap null model generator (song): a new tool for distinguishing between random and non-random song overlap,” Bioacoustics, Vol.25, pp. 29-40, 2016. R. Suzuki and T. Arita, “Emergence of a dynamic resource partitioning based on the coevolution of phenotypic plasticity in sympatric species,” J. of Theoretical Biology, Vol.352, pp. 51-59, 2014. R. Suzuki and M. L. Cody, “Complex systems approaches to temporal soundspace partitioning in bird communities as a self-organizing phenomenon based on behavioral plasticity,” Proc. of the 20th Int. Symposium on Artificial Life and Robotics, pp. 11-15, 2015. 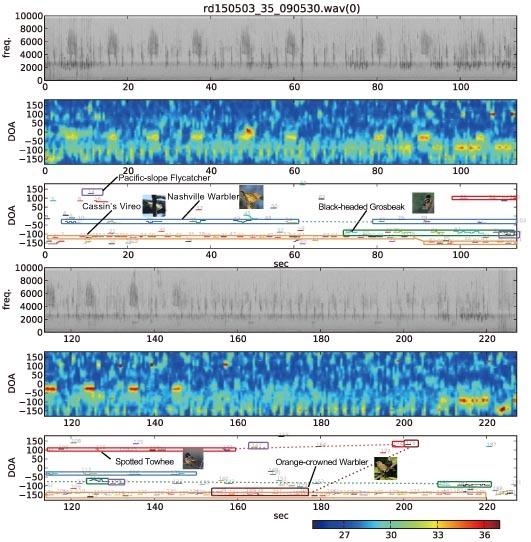 R. Suzuki, R. Hedley, and M. L. Cody, “Exploring temporal soundspace partitioning in bird communities emerging from inter- and intra-specific variations in behavioral plasticity using a microphone array,” Abstract Book of the 2015 Joint Meeting of the American Ornithologists’ Union and the Cooper Ornithological Society, p. 86, 2015. I. Aihara, T. Mizumoto, T. Otsuka, H. Awano, K. Nagira, H. G. Okuno, and K. Aihara, “Spatio-temporal dynamics in collective frog choruses examined by mathematical modeling and field observations,” Scientific Reports, Vol.4, Article ID: 3891, 2014. J. Degesys, I. Rose, A. Patel, and R. Nagpal, “DESYNC: Self-organizing desynchronization and TDMA on wireless sensor networks,” Int. Conf. on Information Processing in Sensor Networks (IPSN), pp. 11-20, 2007. D. Blumstein, D. J. Mennill, P. Clemins, L. Girod, K. Yao, G. Patricelli, J. L. Deppe, A. H. Krakauer, C. Clark, K. A. Cortopassi, S. F. Hanser, B. McCowan, A. M. Ali, and A. N. G. Kirshel, “Acoustic monitoring in terrestrial environments using microphone arrays: applications, technological considerations and prospectus,” J. of Applied Ecology, Vol.48, pp. 758-767, 2011. T. C. Collier, A. N. G. Kirschel, and C. E. Taylor, “Acoustic localization of antbirds in a Mexican rainforest using a wireless sensor network,” The J. of the Acoustical Society of America, Vol.128, pp. 182-189, 2010. Z. Harlow, T. Collier, V. Burkholder, and C. E. Taylor, “Acoustic 3d localization of a tropical songbird,” IEEE China Summit and Int. Conf. on Signal and Information Processing (ChinaSIP), pp. 220-224, 2013. D. J. Mennill, M. Battiston, and D. R. Wilson, “Field test of an affordable, portable, wireless microphone array for spatial monitoring of animal ecology and behaviour,” Methods in Ecology and Evolution, pp. 704-712, 2012. D. J. Mennill, J. M. Burt, K. M. Fristrup, and S. L. Vehrencamp, “Accuracy of an acoustic location system for monitoring the position of duetting songbirds in tropical forest,” The J. of the Acoustical Society of America, Vol.119, No.5, pp. 2832-2839, 2006. R. Suzuki, S. Matsubayashi, R. Hedley, K. Nakadai, and H. G. Okuno, “Localizing bird songs using an open source robot audition system with a microphone array,” Proc. of The 17th Annual Meeting of the Int. Speech Communication Association (INTERSPEECH 2016), pp. 2626-2630, 2016. K. Nakadai, T. Takahashi, H. G. Okuno, H. Nakajima, Y. Hasegawa, and H. Tsujino, “Design and implementation of robot audition system ‘HARK’ – open source software for listening to three simultaneous speakers,” Advanced Robotics, Vol.24, pp. 739-761, 2010. D. R. Wilson, M. Battiston, J. Brzustowski, and D. J. Mennill, “Sound Finder: a new software approach for localizing animals recorded with a microphone array,” Bioacoustics, Vol.23, No.2, pp. 99-112, 2014. T. Schreiber, “Measuring information transfer,” Physical Review Letters, Vol.85, pp.461-464, 2000. R. Marschinski and H. Kantz, “Analysing the information flow between financial time series: An improved estimator for transfer entropy,” The European Physical J. B, Vol.30, pp. 275-281, 2002.